Hurricane Harvey intensified early on Friday into potentially the most powerful hurricane to hit the U.S. mainland in more than a decade, as authorities warned locals to shelter from what could be life-threatening winds and floods. Harvey is set to make landfall late Friday or early Saturday on the central Texas coast where Corpus Christi and Houston are home to some of the biggest U.S. refineries. Oil and gas operations have already been disrupted and gasoline prices have spiked. "Now is the time to urgently hide from the wind. Failure to adequately shelter may result in serious injury, loss of life, or immense human suffering," the National Weather Service said. 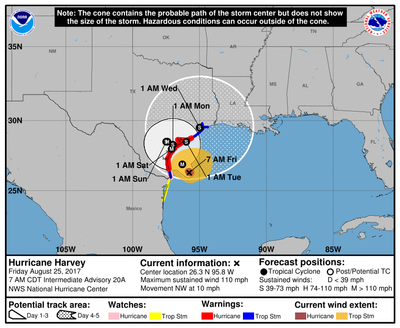 Harvey grew into a category 2 storm with winds of 110 mph (177 kph) as it moved northwest about 145 miles (233 km) off Port O'Connor, Texas, the National Hurricane Center said. "Life-threatening and devastating flooding expected near the coast due to heavy rainfall and storm surge," the hurricane center said. The storm's approach triggered evacuations and forced classes to be canceled on Friday at dozens of schools along the south Texas coast, home to 5.8 million people from Corpus Christi to Galveston. 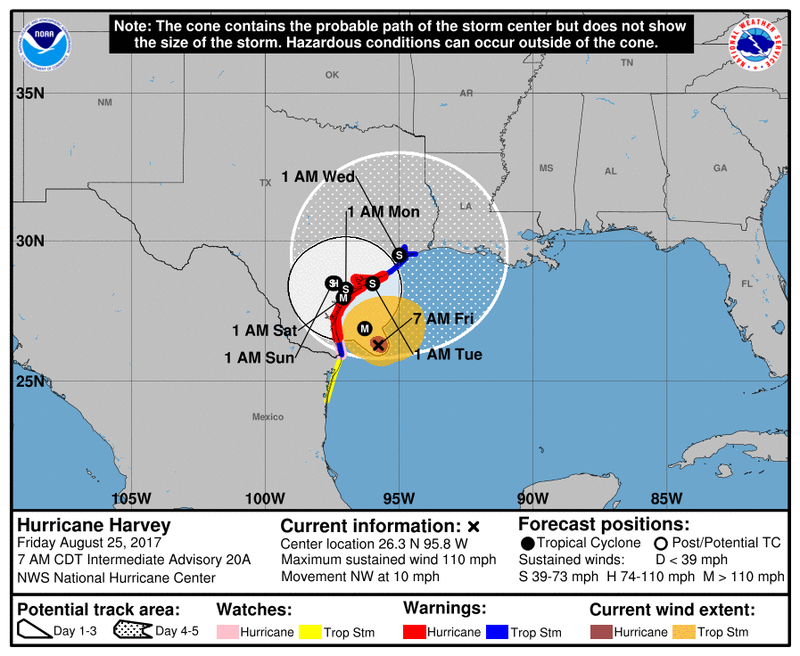 Harvey is forecast to come ashore as a Category 3 hurricane, the NHC said, the third most powerful on the Saffir-Simpson scale. That would make it the first major hurricane to hit the mainland United States since Hurricane Wilma struck Florida in 2005. The NHC expects Harvey to move slowly and linger over Texas for days. Some tracking models forecast that the storm could circle back out over Gulf waters after making landfall, and then hit the Texas coast again. Houston, the nation's fourth most populous city, warned residents of flooding from close to 20 inches of rain over several days. More than 45 percent of the country's refining capacity is along the Gulf Coast, and nearly a fifth of the nation's crude oil is produced offshore. Ports from Corpus Christi to Texas City, Texas, were closed to incoming vessels. Houston-based energy bank Tudor Pickering Holt & Co said in a research note not to expect significant nor lasting production impacts from Harvey. But it said it would impact some production and disrupt refinery runs, imports and exports, "which will show up in the weekly inventory numbers for the next few weeks." Royal Dutch Shell Plc, Anadarko Petroleum Corp and Exxon Mobil Corp have evacuated staff from offshore oil and gas platforms in the storm's path.